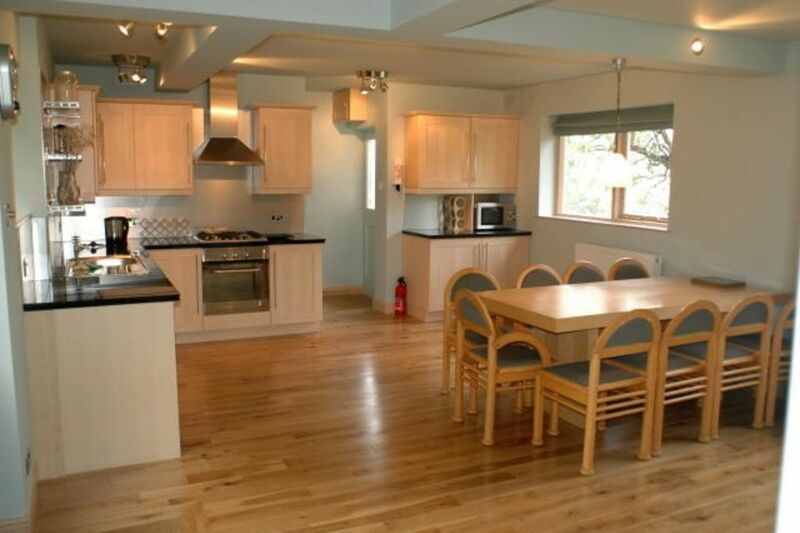 S/C for 9, 4-bed,3-bath Peak District Cottage for a walking & relaxing holiday. Sleeping 9, “Peak Retreat” self catering holiday accommodation promises tranquility and far reaching views. The house offers 4 bedrooms, 3 full bathrooms, (2 en-suite) gardens and modern contemporary living making it perfect for a relaxing holiday. Wi-Fi. Private parking, 5 minutes walk into Hayfield village and within the Peak District National Park. The views are stupendous, looking onto fields both front and back with Lantern Pike one way and Mount Famine the other. The last thing you hear at night will be sheep or cows and first thing in the morning birds. For this reason (mainly) we do not accept dogs/pets at the house. The village of Hayfield with all its amenities are only 4 minutes walk away, so we have all the convenience, with none of the noise. There is private parking for two normal or three small cars opposite the house - you can leave your car parked up and access all the hospitality of village on foot. The property offers a contemporary style with everything you could want for an enjoyable holiday. We are both extensively traveled and know what we like and expect from accommodation away from home. We have aimed to put it into “Peak Retreat”. Through the wee garden gate and up the steps takes you to the front door with a covered deck area outside it. You enter the house into a huge communal room, which is both kitchen and dining with solid oak floor and lots of windows. The light birch kitchen has granite worktops, a stainless steel gas hob, electric oven, hood and splash backs, an integrated dishwasher, microwave and fridge. There is a large table that will seat 8 and all equipment and utensils to create convivial relaxing dining amongst friends or families. There is also a back door at the far end of this room – the tradesman’s entrance for dirty boots, outdoor clothing and wet gear, etc and there is a utility room opposite to put them all in. In the utility room is a washing machine and a second fridge. Stairs from the main kitchen/dining room take you up to two further bedrooms -one triple (3 single beds), which is en-suite, bathroom facilities include a large shower, WC and wash basin. The other double bedroom has a queen size bed and although not en suite does have a wash basin and granite topped vanity unit. There is a lawned area running up the back of the house and a cottage garden at the front with a birch tree and many wondrous plants and flowers that we don’t know what they all are. Spring brings an abundance of colour– daffodils, crocus and tulips. Our small covered deck area at the front is a lovely spot to sit – for breakfast, book reading or just fresh air with easy access to the kitchen for that lovely cup of tea or glass of wine. We would prefer it if visitors refrained from smoking inside the house, thus keeping it fresh for those that follow. However the garden areas we don’t count should anyone have to indulge but please pick up your cigarette ends! There is a gas Bbq for use in the summer months. Hayfield itself has everything you need for both self catering supplies and an enjoyable holiday - a general food store/off license/Post Office along with a chemist, butchers, newsagent, laundry/dry cleaners not to mention several good pubs and eating establishments. There is an Italian restaurant , Colossio down the alley beside the church. The Royal Hotel adjacent to the cricket pitch is in the center of the village and runs many social events throughout the year and serves good basic home cooking. Then we have the George, Kinder Lodge, the Sportsman and the Packhorse in the village yet also The Lantern Pike and The Lamb Inn still within walking distance. There are two cafes in the village too. Mountain bike trails and moorland walks abound and the tamer Sett Valley trail which starts in the village is good for leisurely ambles or family bike excursions. The trail within 10 mins also gets you to The Grouse in Birch Vale, authentic Chinese food and family pub. Also in Hayfield there is a good children’s playground and a skateboard ramp. We are not going to go into all the hundreds of easy-reach attractions here – there will be a folder at the house with lots of ideas in it to help you enjoy your stay. If you wish to plan a little in advance it can be e-mailed to you on request. My roots into Hayfield started to spread when my husband Brian and myself Louise, bought a disused shop with living accommodation in the centre of the village back in 1982 when we first got married. We rolled up our sleeves and started renovating furiously and eventually opened the doors of 'Kinder Kitchen' Easter 1984. We decorated it with 1000 daffodils! This became a successful village cafe with home cooked food in demand from both locals and visitors from afar. A licence was applied for and a bistro style restaurant also ran three nights a week. We also catered in the marquee for the famous Hayfield International Jazz Festival where the virtues of KK's chilli-con-carne were extolled on stage by both Acker Bilk and Slim Gaillard!! Things took off and Louise found herself non stop cooking (luckily a passion) for the next 5 years. We decided to sell the business whilst it was at the top of its game and before Louise wore herself out!. Our next project was a cottage conversion in nearby Chinley. In the middle of all this Louise returned to her original line of work - as long haul cabin crew for British Airways and travelled the world bringing home innovation from hotels, restaurants and ideas picked up along the way. We next tackled Pike View Barn (a second holiday property, now sold) - and turned a cow shed into a super luxurious home, bursting with beams, views and history. However the affinity with Hayfield had always remained with us so when the unusual property that is now 'Peak Retreat' came on the market we saw an opportunity not to be missed! The rest is history! The views from this house are amazing but they had not been taken advantage of by the previous owner. You walked into what was essentially a corridor with small rooms off it.' Oh this cannot be!' we cried and opened it all up into the huge, light and airy kitchen diner that is there today. The original kitchen had been a tiny pokey affair yet left behind was the most amazing original gas cooker in really good condition. I wanted to keep it but was out voted and it took 4 men from the scrapyard to carry it away.They almost smashed our stone steps in the process it was so heavy. Still ever the keen cook Louise wanted a convivial open kitchen which could accommodate large families or a group of friends. A cook should never be alone slaving away whilst dinner guests chat away in another room. The cook should participate in both the conversation and the wine! We must have achieved our aim as we get more comments in the visitors book about our kitchen-diner than anything else. A large dining table with comfy solid dining chairs sits well in the room and there is even a sofa tucked under the stairs for a more relaxed chat. Private parking in Hayfield is at a premium so at Peak Retreat we made a space for three cars. The house has great views from both front and back - over fields and farm animals to the hills afar, Kinder Scout and the surrounding walking country is literally on your doorstep. You will be awoken gently by birds tweeting and cows lowing as you snuggle under your duvet planning what the day ahead can bring. The position of the house is perfect - five minutes walk to Hayfield village centre yet you feel far away from everything and it is so quiet and peaceful. All small food items, newspapers etc. can be bought in the village but several major supermarkets are within 10 minutes drive. Another BIG plus is the number of fine ale houses and eating options that Hayfield has to offer, all accessible on foot so you don't need to use the car at all. Bathrooms were also a high priority on the agenda when converting Peak Retreat. Gone are the days when big groups pile into ski chalets and all share facilities, everyone expects en-suites nowadays. So we juggled architect plans and found the space somehow to install three full bathrooms and a wash basin in the 4th b/r to satisfy the demands of a full house of nine visitors. Our central heating system is state-of-the art and there is lashings of hot water when you come home from your days activity. Brian and I are both well travelled and have strived to put everything a visitor could possibly need into our holiday home, small comforts count and often do not cost much to provide. However we also wanted to make it cost friendly with competitive pricing which works well with a full house (9 beds). We hope to have provided a good quality holiday home at a reasonable price that can be enjoyed by all. One only has to read our reviews or the Visitor Book to see that this has been achieved. This house is ideal for a short breaks where we charge 70% of the full week cost for a Fri - Mon. 3 night w/end or Mon - Fri 4 night mid-week stay. This property has been designed for use as a holiday home and is well endowed with bathroom facilities. As well traveled owners we realize that guests nowadays expect privacy and no longer wish to share a single main bathroom. At Peak Retreat all sanitary ware is white and bathrooms are both fresh and modern with black granite tops, stainless steel splash backs and high quality chrome fittings.There is plenty of hot water. Yes we now have fast speed broadband at Peak Retreat! Small guest towels only. Please bring your own bath towels although these can be provided for a small cost. Visitors flying in from foreign climes - complimentary! Large dining table with 9 chairs. Also there is a small table in the same room which can be added on for extra space/serving food etc. Diner is well equipped for big dinners and convivial dining. At the rear is a small lawned area with a clothes line and active rhubarb patch in season. The front garden is cottage style with birch trees and a bird feeder, also a gas BBQ, outdoor table & chairs. A small wooden terrace is at the entrance of the house. It is under cover and has two chairs with adjoining side table. We allow smoking here but not in the house. Once in the house, yes I would say it is disability friendly, especially with two bedrooms and bathrooms being on the ground level. However there are stone steps up to the front door which would make it problematical for a wheelchair. The house is good for elderly who can make the uphill steps. The large open family kitchen/dining room gives hillside views front and back. This room is the selling point of the house - spacious and clean with a solid oak floor and light maple units having black granite worktops and stainless steel splash backs. It is fully equipped for cooking for larger numbers. Dining is a relaxed affair around the large dining table and there are 8 dining chairs and a carver plus a two seater sofa. The kitchen has all modern conveniences – stainless steel gas cooker with chimney hood, 2 fridges,dishwasher also toasters, juicer, kettle and microwave.The lounge/“snug” is to relax in with 2 comfy sofas CD/TVSKY/DVD/WIFI and a library of up to date movies.Once again a stunning view from this room. A private lawned garden is at the rear of the house and a well-stocked sunny garden, a covered patio area garden furniture & BBQ. Fields flank the property both front and back, and you have private parking for 3 cars.Peak Retreat is unique, both rural & central. Had a great walking holiday with my sister and her family. Beautiful countryside for hikes and house well equipped. Would happily recommend to friends. Summer in Hayfield is lovely! So different to the winter and when the heather is in full bloom (August) it is truly amazing. I am glad you enjoyed your stay and found the property cosy and relaxing - thats what we all want at the end of the day. Come back anytime! Discounts given to second timers. Fantastic new year break in a stunning location! Great accommodation with everything you need. The views from the lounge and kitchen are stunning. The village is fantastic with great, family friendly pubs. Lovely walks with a steep walk back up the hill to park retreat! Stayed at Peak Retreat for a family Christmas and had a great time. Communication with the owner was spot on - going beyond minimum and giving really useful info about the local area and the property itself. Property was clean and tidy, with a cosy sitting room and a fantastic kitchen that was well equipped and a great space to socialise. Ample bathrooms. We thoroughly enjoyed ourselves and I would highly recommend Peak Retreat. We would definitely consider a return. A family Christmas should always be spent in a house that can accomodate you all comfortably without living on top of each other. Children want to play with presents or watch TV and the adults like to reminisce around a laden table with a glass of wine in hand. We hope to have achieved this with the layout of Peak Retreat which I always like to send to guests in a document beforehand. So glad that you had a good time and come back anytime! The house was in a good location and the living spaces were comfortable. It was good to have 3 bathrooms. The sleeping accommodation was comfortable and clean and great for the 7 of us as we all had a bed. We would recommend this house whether you have a group who are eager to walk the surrounding countryside or you just want to cosy up and relax. Glad you enjoyed your ‘girls trip’ and that you found Peak Retreat comfortable for your needs. A full house needs lots of bathrooms!!! Superb location in the heart of peak district. Good facilities and close to nearby village, with wealth of information provided on things to do in area. Our family had a wonderful time! Hayfield is at the edge of the Peak District National Park and is a one hour drive to both Manchester and Sheffield. This area, known as the High Peak boasts fantastic walking country and amazing scenery. You are on the doorstep of Kinder Scout, the highest hill in Derbyshire situated on the famous “Pennine Way” up the backbone of England and where the "Mass Trespass" took place in the 1930's which has resulted in the "Right to Roam" bill that allows you unrestricted freedom in the hills nowadays. Hayfield itself is a pretty Peak District village with stone built cottages and the River Sett weaving through the centre. Feeding the local duck population is a popular pastime. Hayfield cricket pitch is at the heart of the village and matches are played all season. Behind it is an excellent children play area with zip lines, slides and swings.There are an abundance of good pubs and coaching houses – six in the village, ten within a mile. So along with excellent eating options you also find food shops, a chemist, newsagents and a Post Office plus two artist studios all in Hayfield centre. A TV Production 'The Village' series one and two were filmed here so you may recognise 'Hankins Grocers', various cottages, the war memorial and surrounding countryside spots. Glossop and Chapel en le Frith are close by, market towns with supermarkets and a larger choice of facilities. Manchester only 20 miles away, has an international airport, rail and bus links. Nearest railway stations to Peak Retreat and Hayfield are New Mills (2), Chinley and Glossop. Sleeping 9, “Peak Retreat” self catering holiday accommodation promises tranquility and far reaching views. The house offers 4 bedrooms, 3 full bathrooms, (2 en-suite) gardens and modern contemporary living making it perfect for a relaxing holiday. Wi-Fi. Private parking, 5 minutes walk into Hayfield village and within the Peak District National Park.Weekends and short breaks & last minute stays - the house is ideal to self cater for large families or groups of friends, super large kitchen/diner for convivial dining. Kinder Scout and the Pennine Way are on your doorstep famous for excellent hill walking and mountain bike trails. Rock climbing, walking, mountain biking, cycling, golf - the Peak District has it all in a relaxing environment. Lots of Peak District attractions, Chatsworth House, Castleton Blue John Caverns, Buxton & Opera house Alton Towers, Bakewell (tarts!) Lyme Park (Colin Firth wet shirt!) Haddon Hall, Manchester FC Ethiad Stadium, Manchester velodrome. Peak Retreat is a comfortable base for both outdoor enthusiasts and relaxing alike. Hayfield offers 10 country pubs within a mile, all walkable - leave the car parked up. Many do excellent food. The village has food shops, a Post Office plus a pharmacy and there are larger supermarkets within 10 minutes drive. We do not allow pets at our property. You are surrounded by farmland with fields often full of sheep. Other Activities: rock climbing. bouldering. cycling, MTB, hiking. This house is ideal for a weekend breaks, either two families or a group of friends wanting to have a get together. We operate a flat rate for all weekends - 70% of the full week cost. You can arrive Friday (4pm) and leave Monday morning making it a 3 night stay. The same formulae is applied to a Mon. - Fri. 4 night short stay 70% of the full week cost. Any periods outside of weeks or short breaks need to be priced by separate negotiation with the owner. The owners price is the final one, not the HomeAway price. To book your holiday break at Peak Retreat 1) Contact us or view our website for further details if required. www.peak-retreat.co.uk 2) Contact owner by e mail for a booking form. 3) Complete the booking form and return with a 25% deposit to secure the booking. We then confirm booking.